I think we've all seen this pic before. And personally I think there's some truth to it. 90's everyone wanted to be a badass thug. 2000's everyone wanted to look rich. 2010's everyone wantin to show off. Personally, I think things are swinging back around to a mix of 90's and early 2000's though. Don't you agree? Ya ask me 2000's was the best. Ya look rich, ya showin off, livin the high life. 90's look probs get you shot. Don't like the 2010's stuff like what is that even. I wanna see my hero's havin fun and showin how havin money is fun. Ahhh man ya gotta understand tho where the 90's was comin from. It was the heyday of the "gangsta rap", and for a while was the only dominant hip hop genre out there that was sellin. It was a different time and a different culture then bro. A lotta young, angry gangsters looking for a way outta the violence and poverty they was in. Early rappers who utilized it, and were tied to organize crime made it big, and a lot of music became a way of singin bout how life on the streets is tough. Ya still got some of that today, but its less gang warfare now an mostly people just puttin up beef with one another to start drama. You read it all now, but no ones shootin one another. So it's an improvement, ya ask me. True dat man, but there aint so denyin the raw power these guys had about em man. It wasn't about low ridin pants, or silver grillz or anythin. It was raw personality. Lookit em today. Ppl respect coolio, snoop dog, Icecube, an alla them that was on the scene in the 90's. Yeh, snoop dog posts pictures of himself with cartoon girls and bakin cookies with gramma's, but at his prime he was on trial for murder and big in the gangster scene. Man an I aint gonna deny none of that. Im jus sayin though that its better now because hip hop ain all about violence an shootin up cops or other ppl. Plus, look at those same ppl ya mentioned. Once they got off the street, got a bit of money, an started a family they calmed down, an started helpin their communities instead of using em as an excuse to be bitter. 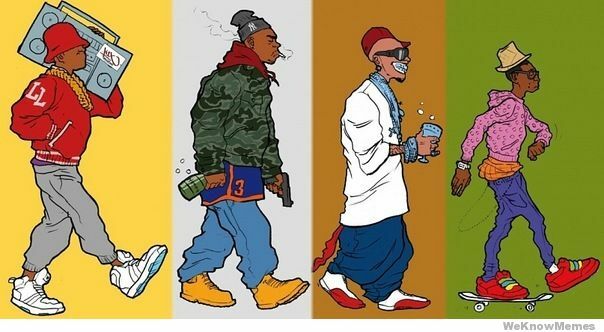 I jus think the hip hop scene is better overall than the 90's, fashion wise too. Yeh, word man I can agree with that. I feel we're gettin off topic tho.